The typical great helm was exceedingly protective, but also had a few drawbacks. This Crusader Helmet - Steel is an attempt to circumvent those shortcomings, featuring some classic elements with a few important revisions. Like its predecessor, this helm has a rounded crown and a flat top, effectively protecting the head and deflecting blows away from the face. Unlike the classic great helm, though, this helmet does not cover the entire back. This feature lightens the weight of the helmet, while also making it cooler to wear. 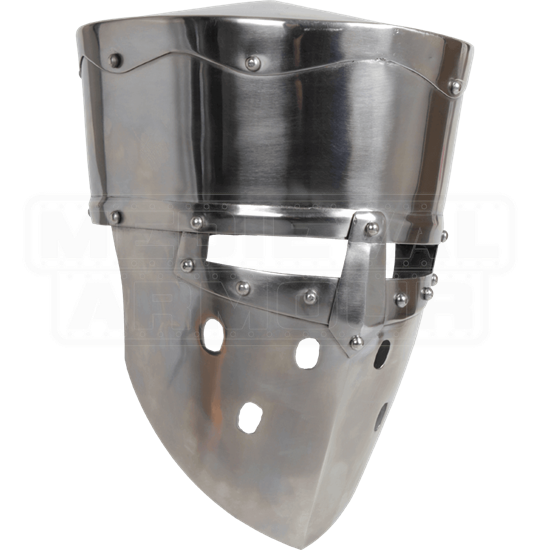 A full steel mask with rectangular eyelets and air holes guards the face. The helmet features an internal liner, both for comfort and size adjustment. Crafted from 18-gauge steel, the helmet features a polished finish. 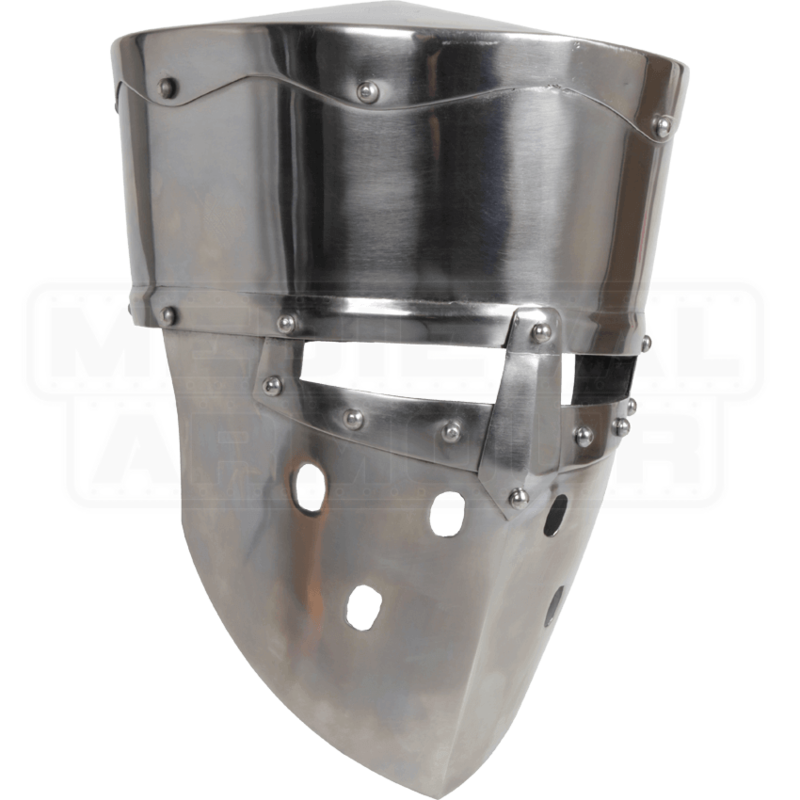 If you want the traditional look of the crusader or knight, but seek a helmet that is a bit lighter and more comfortable to wear, then this Crusader Helmet – Steel is just the protection you are looking for. Medium: Fits a 23 to 26 Inch Head Circumference. Weighs 3.9 lbs. Large: Fits a 24 to 28 Inch Head Circumference. Weighs 4.2 lbs. Rather nice looking helmet, the face plate is not 100% historical in form which does pose a slight issue for me. There is not enough clearance from my nose as its mainly a flat piece, so there is some discomfort, but well placed padding can mediate it a bit. This is really for larp/light reenactment wouldn't use it in a heavy environment due to concerns of smashing my nose to oblivion.